Laws against public intoxication usually require an obvious display of intoxication, such as vomiting. Public intoxication, also known as "drunk and disorderly" and drunk in public, is a summary offense in some countries rated to public cases or displays of drunkenness. Public intoxication laws vary widely from jurisdiction, but usually require some obvious display of intoxicated incompetence or behavior disruptive/obnoxious to public order before the charge is levied. While it is technically illegal in most states and territories of Australia to be drunk and disorderly, most Australian police are relatively lenient about public intoxication. They generally transport the IP ("Intoxicated Person") to his or her residence or temporary detention at a police station or other welfare establishment until the person is sober. In Victoria being "drunk in a public place" and "drunk and disorderly in a public place" are separate offences contained in the Summary Offences Act 1966 which have their own power of arrest. Recent changes to legislation allow police to issue an infringement notice for these offences in addition to the traditional method of charging and bailing the offender to the Magistrates' Court. The current fine attached to the infringement notice is $590 for a first offence and $1,100 for a subsequent offence. A person arrested for being drunk or drunk and disorderly is held at the Melbourne Custody Centre or the cells at a police station or placed in the care of a friend or relative. In New South Wales police have the discretion to issue "on the spot" fines or infringement notices for "drunk in public", a fine that costs the individual over $480 (4 penalty units). Community Legal Centres across the state complain about these fines and the impact it has had on various vulnerable members of the community, including young people, the homeless and minority groups. Prosecution (charging) is generally only considered if the person is violent or other offenses have been committed. As an example, a "Drunk and Disorderly" Fine in the State of New South Wales starts at $550. As of February 2009, local councils in the state of New South Wales are not allowed to charge people who drink in alcohol-free zones; they are only permitted to confiscate the alcohol of the intoxicated person. In Canada, liquor laws are made by the provinces and not the federal government. In British Columbia, drinking in public and public intoxication are offenses. If an event is to take place in public with alcohol it must have a permit. In Ontario, drinking in public and public intoxication are offenses. Having an open container in public garners a $125 fine. Public drunkenness garners a $65 fine and detainment until sober. If an event is to take place in public with alcohol it must have a permit. While liquor laws are similar from province to province, the laws in the territories tend to be substantially different. For instance, in the Northwest Territories public intoxication can result in imprisonment or detention in a medical facility for up to 24 hours (NWT Liquor Act). 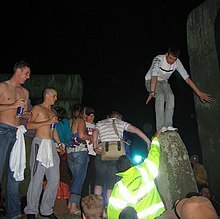 In the United Kingdom, the police normally only enforce the laws against public intoxication if the intoxicated person is unable to act in a reasonable manner, as demonstrated by such activities as climbing on Stonehenge (pictured). In the United Kingdom, there are a number of offences dealing with intoxication, which vary between the constituent countries. while in, or attempting to enter, a "designated sporting ground" (a football ground) during a designated sporting event. The police will only get involved if the person is so drunk they are unable to act in a reasonable manner, such as passing out on the street. In that case typically the police will, depending on the circumstances, help the intoxicated person on their way or place the person in a police station cell until sober. Once fit to be dealt with the detained person will normally either be cautioned, be issued with a Penalty Notice for Disorder (PND – £90 fine in ticket form) or bailed to appear at the local court. The court in turn may issue a fine (up to level 1 or level 3 on the standard scale depending on the offence charged). There are also many more specific offences, including driving a motor vehicle while drunk (or being found 'drunk in charge') and riding a cycle while unfit through drink. Furthermore, the police have the power (although not the obligation) to confiscate any alcohol which is being consumed in public by those under 18, and local authorities have the power to prohibit alcohol consumption in certain areas. In New Zealand, drinking in public is not a crime and instead, local governments must specify that alcohol is banned in an area before it is considered a crime to drink in that location. Being drunk in public is not specifically an offense unless the person who is intoxicated is a public nuisance, in which case they may be dealt with for 'disturbing the peace'. This will usually result in being taken home, or otherwise taken to a police cell until sober. Public intoxication laws in the United States vary from state to state, and some states consider it a misdemeanor to obstruct sidewalks as a result of intoxication. Laws in the United States regarding drunkenness vary widely from state to state. In 1968, in the case of Powell v. Texas, the Texas law against public intoxication was challenged in the Supreme Court of the United States for alleged violation of Eighth Amendment, which forbids cruel and unusual punishment. The court upheld the law, ruling that criminalizing public intoxication was neither cruel nor unusual. California: California Penal Code 647(f) considers public intoxication a misdemeanor. The code describes public intoxication as someone who displays intoxication to liquor, drugs, controlled substances or toluene and demonstrates an inability to care for themselves or others, or interferes or obstructs the free use of streets, sidewalks or other public way. California Penal Code 647(g) affords law enforcement the option to take an individual fitting the arrest criteria for 647(f), and no other crime, into civil protective custody if a "sobering facility" is available. Essentially, the detainee agrees to remain at the location until the facility's staff consents to their departure; usually after four hours and upon the belief that the detainee is safe to look after themselves. Not every municipality in California has such a facility. Also, if a person is being combative and/or is under the influence of drugs, they will be taken to jail. Unlike a person who is taken to jail, a civil detainee under 647(g) is not later prosecuted in a court of law. Colorado: Public intoxication in the state of Colorado is not punished with criminal or civil penalties. Instead, state law prohibits the passing of local laws that penalize public intoxication, but state law provides for the creation of patrols trained to provide assistance to intoxicated and incapacitated people. Georgia: In Georgia, public intoxication is a class B misdemeanor. Public intoxication is defined as a person who shall be and appear in an intoxicated condition in any public place or within the curtilage of any private residence not his own other than by invitation of the owner or lawful occupant, which condition is made manifest by boisterousness, by indecent condition or act, or by vulgar, profane, loud, or unbecoming language. Indiana: In Indiana, public intoxication is a class B misdemeanor, punishable with up to 180 days in jail, and a $1,000 fine. As of 2012, simply being intoxicated in public is no longer a crime. The person must also be, (1) endangering the person's life; (2) endangering the life of another person;(3) breaching the peace or is in imminent danger of breaching the peace; or (4) is harassing, annoying, or alarming another person. (See IC 7.1-5-1-3). Iowa: The Code of Iowa Sec 123.46 states that "a person shall not be intoxicated or simulate intoxication in a public place". Public Intoxication is a Simple Misdemeanor punishable by a maximum of 30 days' jail and a $1,000 fine. Aggravated Public Intoxication (3rd or subsequent Offense) is an Aggravated Misdemeanor punishable by a maximum of 2 years in prison. As of 2013, Johnson County, home of the University of Iowa had the highest arrest rate for public intoxication of any county in the state, at 8.28 per 1,000 residents. Kansas: Being drunk in public in Kansas is not a criminal offense. Kansas statute 65-4059 states "No county or city shall adopt any local law, ordinance, resolution or regulation having the force of law rendering public intoxication by alcohol in and of itself or being a common drunkard or being found in enumerated places in an intoxicated condition, an offense, a violation, or the subject of criminal penalties." Minnesota: Public intoxication is not a crime in Minnesota. However, cities can enact laws against public intoxication, such as the City of St. Cloud. Missouri has no state public intoxication law. Missouri's permissive alcohol laws both protect people from suffering any criminal penalty (including arrest) for the mere act of being drunk in public, and prohibit local jurisdictions from enacting criminal public intoxication laws on their own. Montana state law states that public intoxication is not a crime. However, the law allows law enforcement to take an intoxicated person home, or to detain them, if they are a danger to themselves or others. The law also states that no record can be made that indicates the person was arrested or detained for being intoxicated. Nevada has no state public intoxication law. Nevada state law both protects people from suffering any criminal penalty (including arrest) for the mere act of being drunk in public, and prohibits local jurisdictions from enacting criminal public intoxication laws on their own. Texas: Public intoxication is a Class C misdemeanor (Class C misdemeanors are punishable by fine only not to exceed $500). However, if the offender is a minor, harsher penalties apply (especially if a two-time prior offender in which case jail time can be ordered). Section 49.01 of the Penal Code, which legally defines "intoxication", includes both a blood alcohol content greater than 0.08 but also defines it as "not having the normal use of mental or physical faculties by reason of the introduction of alcohol, a controlled substance, a drug, a dangerous drug, a combination of two or more of those substances, or any other substance into the body"; thus, a breathalyzer or field sobriety test is not required to prove public intoxication. This low standard of proof has led to criticism that officers are using "public intoxication" as a means of harassment, especially towards minority groups. Virginia criminalizes public intoxication under section 18.2-388 of the Code of Virginia. It is punishable by a fine of up to $250. Wisconsin also does not have a state public intoxication law although municipalities may pass city ordinances prohibiting public intoxication. Public intoxication is legal in Milwaukee, however, public drinking is not. ^ "Summary Offences Act 1966". Australian Legal Information Institute. Retrieved 21 September 2011. ^ "Infringements (General Regulations ) 2006 - Schedule 3 Section 10AA". Australian Legal Information Institute. Retrieved 21 September 2011. ^ "Tough new laws to tackle drunken louts". Premier of Victoria. Retrieved 21 September 2011. ^ "section 12 Licensing Act 1872". Statutelaw.gov.uk. Retrieved 2010-02-26. ^ "section 91, Criminal Justice Act 1967". Statutelaw.gov.uk. Retrieved 2010-02-26. ^ "section 139, Air Navigation Order 2009". Statutelaw.gov.uk. 2009-11-17. Retrieved 2010-02-26. ^ "section 2, Licensing Act 1902". Statutelaw.gov.uk. Retrieved 2010-02-26. ^ "CAL. PEN. CODE § 639 : California Code - Section 639". Caselaw.lp.findlaw.com. Retrieved 2010-02-26. ^ "Colorado Public Intoxication Laws". Retrieved 2014-10-21. ^ "LexisNexis Custom Solution: Georgia Code Research Tool". Lexis-nexis.com. Retrieved 2010-02-26. ^ "Indiana Code 35-50-3". In.gov. Retrieved 2014-01-26. ^ "340A.902 - 2015 Minnesota Statutes". www.revisor.mn.gov. Retrieved 2016-05-05. ^ "Code of Ordinances | St. Cloud, MN - Official Website". ci.stcloud.mn.us. Retrieved 2016-05-06. ^ "Section: 067.0305 Counties or cities not to arrest or punish for public intoxication. RSMO 67.305". www.moga.mo.gov. Retrieved 2016-05-05. ^ "Article 53-24-107 of the Montana Code". Leg.mt.gov. Retrieved 2010-02-26. ^ Texas Penal Code Section 49.02. ^ Texas Penal Code Section 12.23. ^ Texas Alcoholic Beverage Code Section 106.071. ^ "Texas Public Intoxication Laws Allow for Arrest Without Intoxication. Or Even Drinking. - Hit & Run". Reason. 2010-02-26. Retrieved 2014-01-26. This page was last edited on 12 April 2019, at 21:11 (UTC).